A well-run business, the Coach House is a success story in an industry where many have failed. “If you like music, it’s a fun place to go,” added Folgner. Opening in 1980, this concert hall originally started out doing country music, then evolved into hosting music groups of all types: rock n’ roll, jazz, blues and more. From the famous, to those just starting out, and many in-between, a wide variety of groups perform there. Local talent and up-and-coming groups headline popular groups. Many well-known performers have played at the Coach House including: BB King, Leon Russell, Mark Cohen, Chris Isaak, Hootie and the blowfish, A Flock of Seagulls and hundreds more. Autographed photos of bands that have played this venue decorate the walls of the huge warehouse-style room. Due to the versatility of the music played, all ages can enjoy the Coach House. In an industry where some music groups can attract a wild crowd, Folgner explained, “we don’t do punk or rap music anymore. We’ll do hard-edge, alternative music, but I try to stay away from anything that’s really violent.” A quick glance around the concert hall reveals plenty of security personnel in force; just in case. 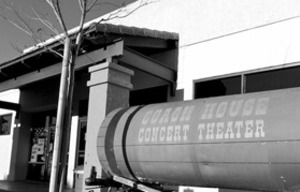 Since the Coach House has its own in-house box office, ticket prices are kept at a reasonable fee, without the mark-up of a third party re-seller. Its online site, www.thecoachhouse.com, offers a list of the entertainment line-up, and a copy of the dinner menu. Dinner entrees include filet mignon, seafood and salads. Appetizers include sautéed mushrooms and jalapeno poppers. The desert menu is luscious with items like chocolate wipeout and raspberry cheesecake. Patrons who come to dinner are offered priority seating, closest to the band. In fact, one can sit so close they could touch the stage. That’s if they actually desire to be that close to the speakers! Although the room is large, the atmosphere is intimate. Shared dinner tables become an opportunity for conversations to flow, and good times to be had. For folks who wish a bit of privacy, the VIP rooms on the 2nd floor are available for groups of 2-14 for a flat fee. These rooms include a personal food-server. Booths on the side of the main floor are also available.